Thousands of electric cars are now communicating with owner’s smart phones, charging stations, and service networks. These EVs are plugging into smart grids that use network communications to charge off-peak, monitor and improve reliablity. When I use my Blink EVSE to charge my Nissan Leaf, the charger sends a packet of info to the charging network every 15 minutes using Sprint. The charger is communications-ready supporting CDMA, Wi-Fi, and powerline communications (PLC). With the Nissan LEAF app on my Droid I can remotely monitor charging, or pre-heat or pre-cool the car while still plugged-in, saving battery range. My Droid uses Verizon. While driving, the LEAF’s navigation system uses GPS. If I want to listen to Pandora, my smartphone communicates with the LEAF via Bluetooth. When I park at a ChargePoint for public charging, the Coulomb ChargePoint uses RF to talk with my member smartcard. When charging, the ChargePoint uses various wireless carriers in different countries with protocols such as GPRS and CDMA. The charger even sends me a text when charging is completed or if someone disconnects my car. A DOE study identified how we can charge 170 million electric cars in the U.S. before needing to add generation such as renewables, natural gas, nuclear, or coal. Charging needs to be done off-peak. With smart charging communications that is easy to do. I have preset charging my LEAF off peak. When I connect the charger, no electrons flow until the nighttime hour is reached. State utility regulators need to allow utilities A low rate for off-peak charging and higher for on-peak charging and electricity use. No benefits occur until utilities upgrade their old one-way grid communications to two-way smart grid. As utilities install smart meters, such time of use (TOU) pricing and demand response become realities. Beyond what is visible to their customers, electric utilities are becoming more reliable and efficient with smart grid technology that communicates: advanced meters, smart transformers, sensors, distribution automation, and intelligent energy management. When I charge and use electricity at home, my PG&E utility smart meter uses RF mesh technology to route the data along with sensor data so that they can manage the grid, collect billing information, and allow me to view home use through an internet browser. As wireless carriers lower their rates to compete with mesh networks, other utilities take different approaches. Texas utility TNMP is including a CDMA modem in all of the 241,000 smart meters that it is installing. Transformers and distributed automation are smarter so that sudden changes in load can be better managed and an outage in one location does not take down the neighborhood. 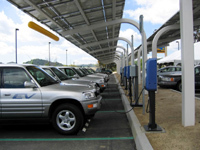 SDG&E is charging thousands of electric vehicles with a smart grid. SDG&E is installing smart transformers and distributed automation that more quickly isolates and handles problems. These devices communicate with centralized GIS and IT applications that keep everything running. Cisco 1000 Series Connected Gird Routers are integral to the field area network. Duke Energy’s David Masters writes, “Duke Energy defines the digital grid as an end-to-end energy Internet powered by two-way digital technology. It is comprised of an Internet Protocol (IP) based, open standards communication network that allows for automation and the exchange of near real-time information as well as enabling the adoption of new technologies as they become available. Duke Energy’s digital grid will have more efficient and reliable transmission and distribution systems; it will leverage energy efficiency programs to reduce wasted energy; it will integrate more distributed energy resources into our grid and decrease carbon emissions.” Duke Energy is co-locating 3G and 4G cellular communication nodes with transformers. These WAN nodes communicate with RF and PLC to smart meters, charging stations, demand response appliances, street light systems, grid sensors and capacitor banks. EPB, Chattanooga, Tennessee, not only delivers electricity to the home, it delivers broadband fiber optics for fast internet access and streaming video. While most utilities are slowly deploying smart grid, starting with smart meters, EPB installs a broadband router in the home with far more capability than a meter. Our use of energy will get smarter as utilities fully-deploy smart grids and regulators encourage them share more information. For example, automakers are already demonstrating smart apps so that owners could program preferred charging to occur when high-levels of renewable energy is delivered to the grid, such as wind blowing at night. Smart apps and RE price incentives would encourage the growth of clean and safe energy. Instead of firing-up dirty peaker plants on hot afternoons when air conditioning is blasting, a smart grid could draw power from utility fleets that are glad to sell power at premium rates. Vehicle-to-grid (V2G) has been successfully tested. V2G is part of our future. The ongoing deployment of smart grid infrastructure (i.e., smart meters and distribution automation) in the U.S. is prompting utility strategists to re-evaluate their organizations’ back-end enterprise architectures in order to enable next-gen utility business and operational services, such as dynamic pricing, grid optimization, self-healing grids and renewables integration. Utilities are just now beginning to understand the implications of outfitting their dated enterprise architectures with current information (IT) and operations (OT) technologies required to offer next-gen smart grid applications. It will take years for most utilities to deploy smart grids. The cost will be in the billions. The savings will be in the trillions as drivers use less foreign oil and as level demand and energy efficiency replace the need for new coal and nuclear power plants. Growth is strong for electric vehicles, renewable energy, and smart grid. The growth of one benefits the other. With smart communications, we are enjoying efficient transportation, energy independence, and clean air.